Old Garage turned Mini Dream Home! Hello there! It’s been a busy week with a trip to Seattle for the Picasso exhibition and a drive out to the coast but I knew I had to share this amazing remodel with you before the week came to a close. This lonely little detached garage is just begging for some love. The after! Isn’t it fabulous!? 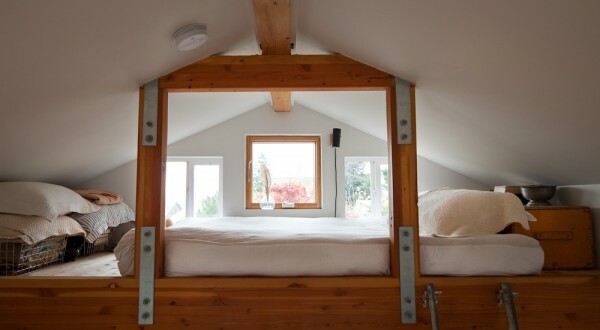 A cozy, light filled sleeping loft is so perfect for the space. Must be a dreamy spot on all those rainy days. 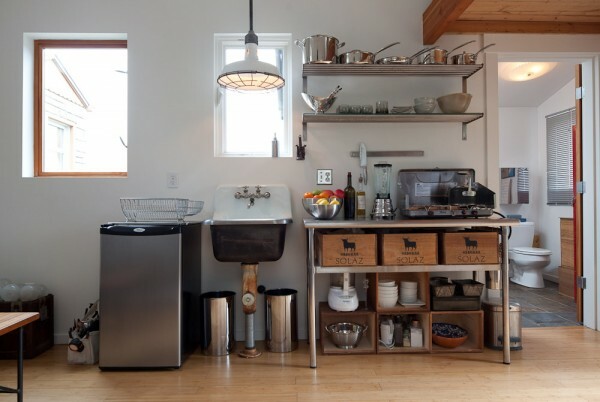 The kitchen is well organized and accessible with open storage solutions. Love those vintage crates that most likely serve as drawers! 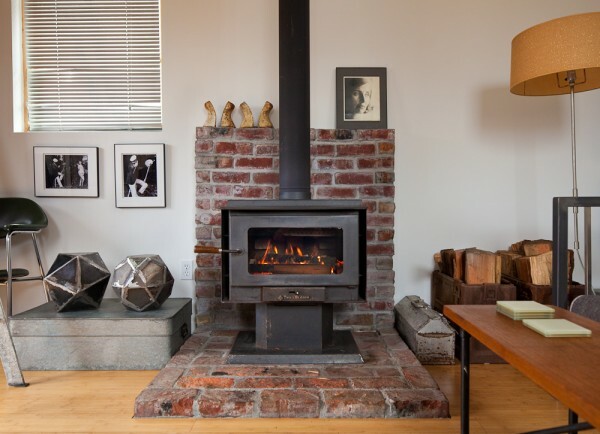 The rustic wood burning stove becomes sculptural in this room along with Michelle’s own art installations. The glass boxes housing pillow forms are actually a tribute to Michelle’s father. 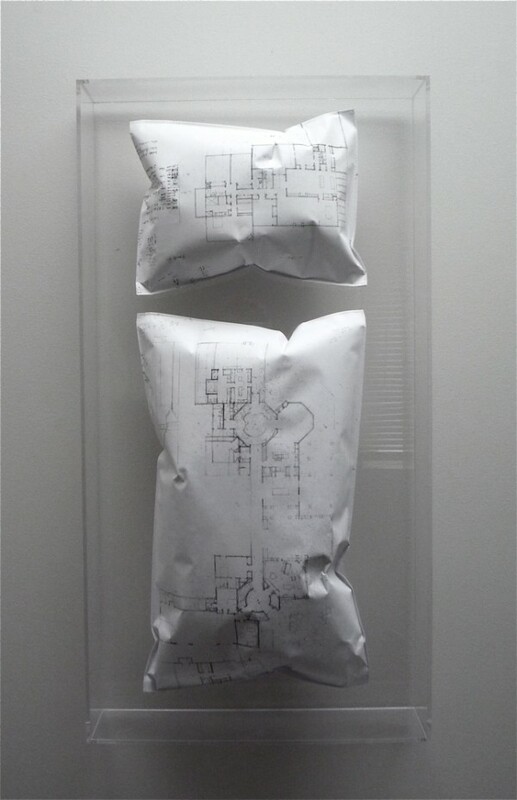 Each one is covered with his old architectural drawings. A lovely personal and nostalgic touch. You know I am a big fan of great bathroom design and this one delivers. 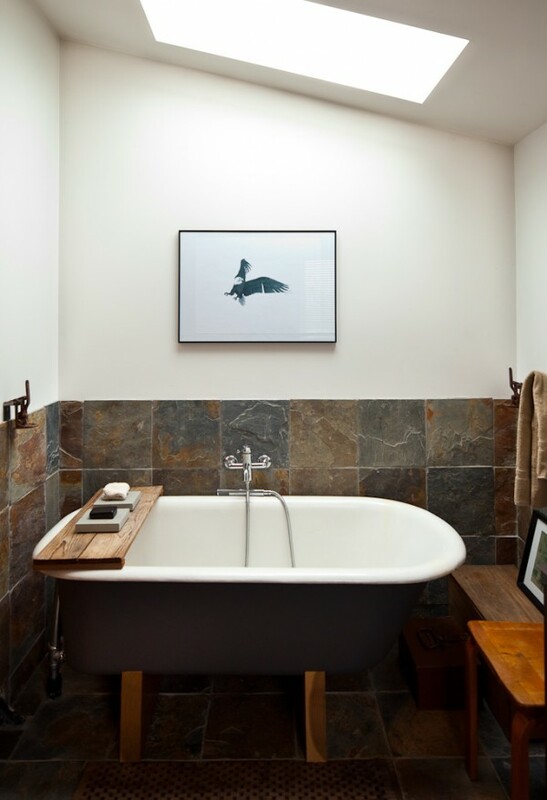 Its simplicity is calming, earthy and zen like and I love how surprising a tub is in this tiny home! To finish our little home tour, I had to point out this old locker. 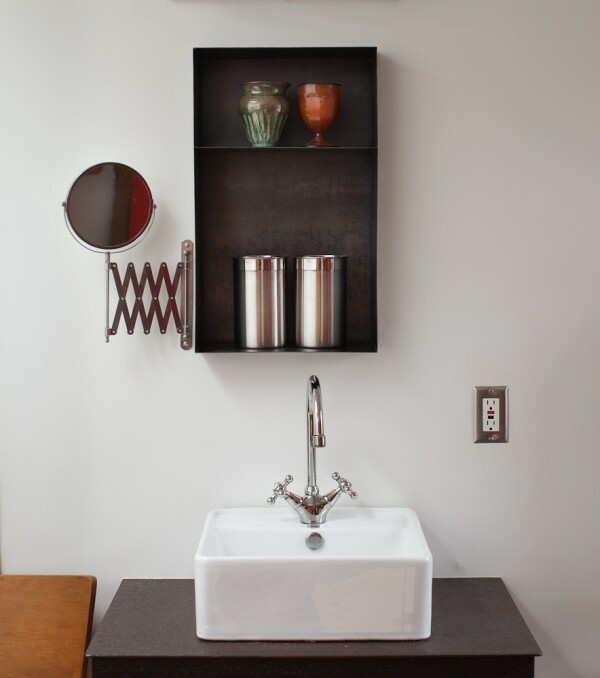 Re-purposing found and used objects like this really adds to the depth and personality of your home. It’s also a great way to be green! Up-cycled perfection. Oh and just so you know…Michelle only spent $32,000 on the renovation! what would you spend it on?????????? This is very nice. In fact, I like very thing about it. I thinks this ideas should be used for small houses/housing projects in my part of the world; Africa. Please keep can I get the ebook/word version of how you went about it. God bless you. Keep it up. Now this is awesome. If I was a single man and didn’t have kids, I could definitely picture myself living happily in there. Michelle de la Vega did a wonderful job transforming this garage into a home. It’s misleading if you look closely at the before and after pictures. Look at the trees and houses in the background. Still space wise it a nice design for 250sq ft.
Ben, I noticed the same thing! Sure the new one is really nice, so good job on that! But why put some other garage and lie it’s been “transformed” You can totally see those buildings are in different places! This is so amazing! 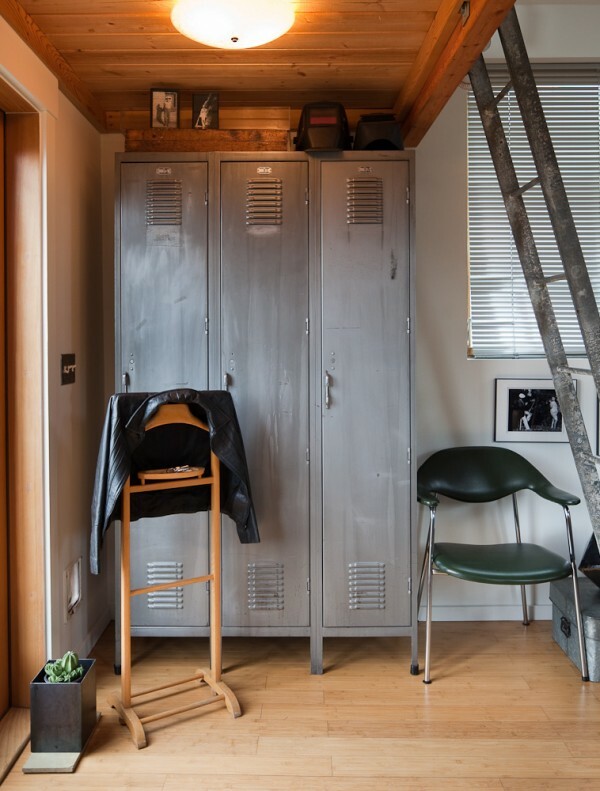 Great use of a small space that otherwise would be wasted on hoarding stuff that doesn’t get used anymore. Would love to have a place like this to be used as a guest cottage. 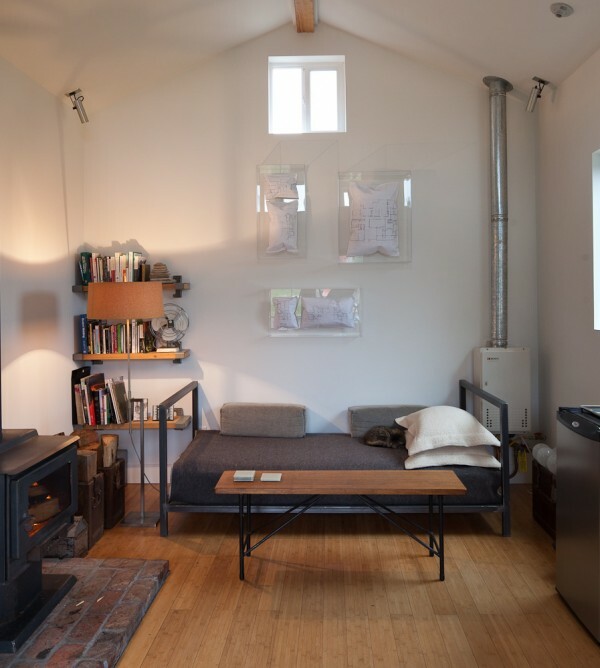 I like the design, but I keep seeing all these loft sleeping spaces with ladders, and I can;t help but think that these are not spaces for anyone much beyond their 40s to live in.. at best. I must say what Richard said is exactly what I’m thinking, I’m single and have no kids. So this would be the ultimate living space for me. I could be so creatively inspired there, especially on rainy days. Awesome metamorphosis! so cool, how much money was this transformation? Wow, can he do my garage next? LOL! You have a nice post. I love those beautiful pictures. I particularly love your well-organized kitchen. Great shot! Thanks so much Rom! Glad you enjoyed it! Yes truly amazing, Jalal! I just love this one. Thank you for visiting. I was delighted to view the garage living quarters. How much space we leave unused and this was just a great example of turning that around and making it a functional living space. Your paying taxes on it, it may as well be usable. Loved the creative flow. Thanks. @ Mia, why would you assume that it’s not the same structure? Do you not think that it could have been photographed from two different angles? What makes you think that in re-designing the garage, she couldn’t have closed in the original garage door opening with a wall, and create a new door opening on the opposite wall? Must you be so negative? Why not just appreciate the vision of a obviously creative thinker? Hey there! I know this is kinda off topic but I was wondering which blog platform are you using for this website? I’m getting fed up of WordPress because I’ve had issues with hackers and I’m looking at alternatives for another platform. I would be awesome if you could point me in the direction of a good platform. Hi Rodney. Thanks for stopping by. This is actually a WordPress blog and so far no trouble with hackers. 🙂 Hope you find a platform that works for you…I’ve hear Typepad is really good too. Wow! I must say that this is really great. I couln’t imagine a haven with a very little space up til now. this is splendid! The pillows made out of old drawings are amazing. My Dad is a builder and still draws his plans by hand instead of using a CAD program. I can see us doing something like this sometime. The house is delightful!. It’s it used for a retreat or is it a primary residence? I only wish this was a full length story (or show!) detailing the whole start to finish! Awesome photos. I am so envious of this house! I probably spend 32,000 on rent in 2 years! Wow, amazing work. Very well done… I’d most certainly live there. Good design is always fun to see. I found this little gem on hubski.com of an outdoor chicken coop designed properly. Check it out, I’ll provide the link below. Again, great work. Hi Steve. Thanks for visiting the blog, I’m glad you enjoyed this post. Also, thank you for the link to the chicken coop/veggie garden. What a brilliant idea!!! What key words would I use on google to find out how to make something like this? My greatest concern is the plumbing. I probably would consult a plumber but what keywords would I search for on the internet to find more about this stuff? Esto si que es increible… que espacio tan hermoso asi pequeño me encanto..increible..hermosooo..felicito a quien realmente hiso esto..!! Thanks Cami! It’s a beautiful remodel, that’s for sure! Thx for visiting my blog. BEST TINY HOME/OFFICE LAYOUT THAT I HAVE SEEN. ELEGANCE WITH FUNCTION. JUST BEAUTIFUL. Hi Jon. Thanks for stopping by! I agree! This one has stunning design and function. So important! This like a wonderful Interior Designs. Thanks for sharing it. Stunning! I really love the design, it feels so cosy and home! Big up! I agree the end result is fantastic and I don’t mean to spoil the fun but that isn’t the same building! Nice. 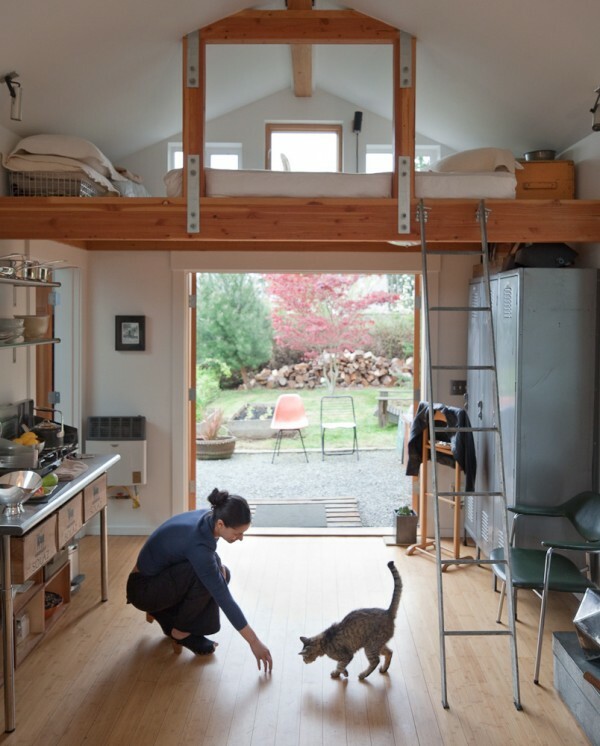 Similar to plans I have to convert a 13’x19′ shed into a WeeHouse. In my design, I have a full blown kitchen where she put her double doors – beautiful but they take up a whole wall. She also could have put the Rinnai tankless heater in an outside access closet behind the tub. I’ve got to do that for mine because I also need space for my pressure tank for my water well and a place for my circuit breaker panel. She must have moved the garage to a new location because that W. Red Cedar on the left. The wood stove too looks way too big for the space. Mine is about that size and it heats a 1600 sqft basement really well and keeps my 1700 sqft main floor tolerable even in Jan. You could definitely get by with a much smaller stove in Seattle’s mild winters. Cheers and good work. looks amazing… but I feel like getting out of the bed would be painful.. I think I’d bonk my head nearly every morning! Very elegant design in its simplicity. Re: Will’s comment; it is obvious that the roof was raised and the volume thus increased. Perhaps that is what gives you the impression that the double doors have a different proportion from the inside. I also think the garage door opening was larger that the new french doors. I would love to have product information on the bathroom faucet and sink. I love the salvaged finds! That was perfectly great…gives me an idea how to turn an old boat hangar at the beach front. Great post! The renovators are is the best creattive ever, they’ll be able to transform from old to new, from useless to usefull. So good taste for decoration also! Awesome! Love the creativity and ingenuity. Got some idea for our old garage. Thanks for the great post.